Use caution when setting up and polishing using the Bench Lathe. Wear safety glasses whenever machine is on. Connect dust collector to dust collection system hoses. Turn dust collection system on when bench lathe is in use. Keep dust collector free from debris--cleaning after each use. When the bench lathe is on, work in the lower front quadrant of the wheel only. If the wheel grabs what you are working on, let it go, turn off the machine, wait for the wheels to stop spinning then retrieve your item. The items being polished might get warm or hot--use caution and be aware of all that is going on. Turn the machine off if the item gets too hot to hold. Wait for it to cool down and begin buffing or polishing again. DO NOT polish any type of chain using the Bench Lathe. Secure bench lathe to your work surface using either the suction cup feet or by installing bolts through the mounting holes found in the base. Connect the spindle/mandrels to the motor shaft. Determine which spindle is for the left side and right side (find the L or R marker on the spindles). Slide the spindle onto the appropriate motor shaft. Line up the set screw with the flat side on the motor shaft. Leave 1/8 inch space between the motor housing and the inside edge of the spindle or mandrel. Using the supplied hex key, tighten the set screw to secure the spindle or mandrel in place. Buffing wheels are spun onto the spindles and mandrels to secure them in place. Turn the bench lathe on then place the selected compound against the lower front section of the wheel. Hold until the wheel is charged. Do not apply too much compound --too much compound could make the finish of your work hazy (it can be buffed off but that is one more step). If you apply too much compound, it will wear off eventually; all is not lost. Once a wheel is charged with one compound it is best to not use this wheel for any other compound. As you buff or polish a piece, wash it off before moving onto the next compound or you will contaminate the wheel, bringing in a more coarse grit from the polish before. If this occurs, transition this buff to the lower grit compound then start a new wheel to replace the contaminated one. Label all wheels to indicate which compound it holds. Once the wheel is charged you can begin buffing and polishing metal items. When buffing then polishing, move through the various grits, working from most coarse to finest polish, until you are pleased with the results. For optimum results, sand the cured polymer to a fine-grit sand paper polish before polishing with the Bench Lathe. 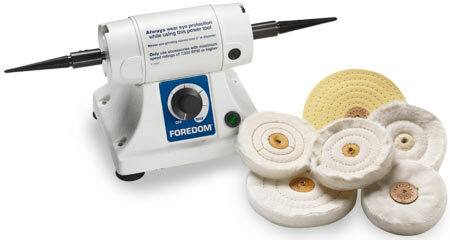 Do not charge the buffing or polishing wheel with any compound. Move the cured polymer around; do not hold in one spot for too long. If held in one spot, polymer will heat up and begin to melt as well as grab fibers from the wheel.